Some people pride themselves that they don’t ever cook from recipes. Not me. I rely on recipes, daily and heavily. And that is not only because being a cookbook author and food editor, I feel that the shunning of recipes – viewing them as the crutches of mediocre cooks while real, natural talents cook without – undermines the very foundation of the trade. Why should I burden my already overcrowded memory with things that others (and mostly pros, or cooks far better than me) have figured out and conveniently written down, such as the amount of baking powder in a cake? Julia Child failed her exam at the Cordon Bleu the first time around because she had not memorized the recipes from the school’s cookbook. There is no need to say anything more about the connection between memory and cooking talent. Rather than piecing a recipe together from memory, I like to spend my time exploring. The few vegetables still growing in the garden in mid-November – beets, radicchio, kale, and cauliflower – do not require any more work, so one of my Sunday morning luxuries is to explore new recipes and ingredients. Today I tinkered with the persimmons I found at a local farm stand yesterday. Call me a culinary greenie but I have never eaten nor prepared persimmons! I wanted to leave the persimmons as unaltered as possible. After leafing through cookbooks and surfing the web, I settled on poached pears with persimmons, inspired by a recipe I found in Deborah Madison’s Vegetarian Cooking for Everyone. It is best served chilled. 1. Bring 1 quart of water to the boil in a wide pot. Add the sugar and stir to dissolve. Add the ginger and lemon zest. 2. Peel, halve, and core the pears. Place them in the simmering water and put a small heatproof plate on top so they are fully immersed in the poaching liquid. Simmer for 20 minutes, or until the pears can be easily pierced with a knife. 3. Transfer the pears to a bowl. Strain the poaching liquid and pour it back in the pot. Bring to a rolling boil and cook for 10 minutes, stirring and scraping the sides often so the syrup does not burn. 4. Stir the cranberries into the hot syrup. Pour over the pears. Cool, then refrigerate. 5. Remove the blossoms ends from the persimmons. Using a serrated knife, cut the persimmons into thin slices. 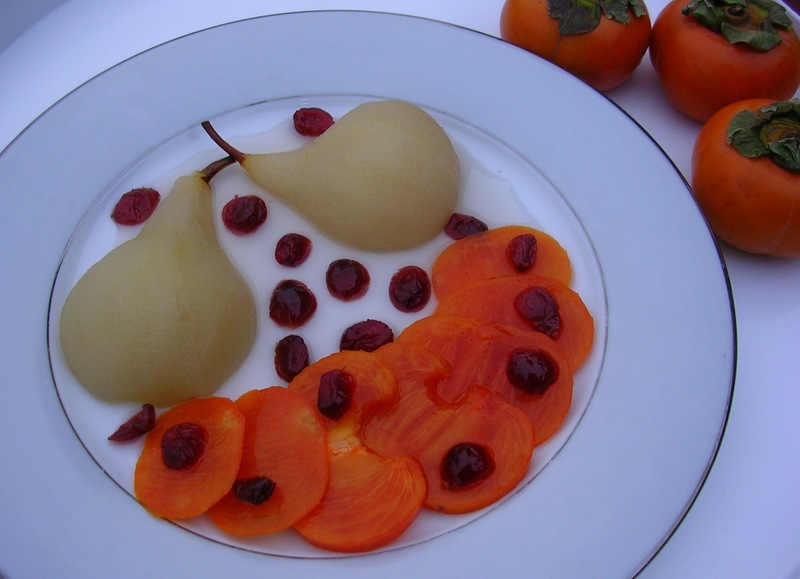 Serve with the sliced pears and cranberries, drizzled with syrup.